mkgallery got a sneak peek at the sweat suit. Earlier this year, mkgallery definitively proved that the meat sweats are real—one gets them when eating too many (is there such a thing?) delicious meats. A plate of spicy sausages. A rack of barbeque ribs. A juicy steak. These are things that you can eat that would give you the meat sweats. But what if there was a way—and hear me out here—for people who love meat enough to actually wear meat sweats. You’re probably thinking that I’m spouting complete nonsense, but Arby’s—one of the main fast food purveyors of meat sandwiches—has found a way to create actual wearable meat sweats, the perfect accessory for obsessive meat lovers. Don’t get too excited my carnivore friends: The Arby’s meat sweats aren’t going on sale. No, these sweats are reserved for only the most dedicated meat lovers. According to Arby’s, the sweats have to be “earned.” Share a photo or video of yourself on social media enjoying meat—grilling, broiling, cutting, or otherwise cooking up your favorite variety—and you might attract Arby’s attention. 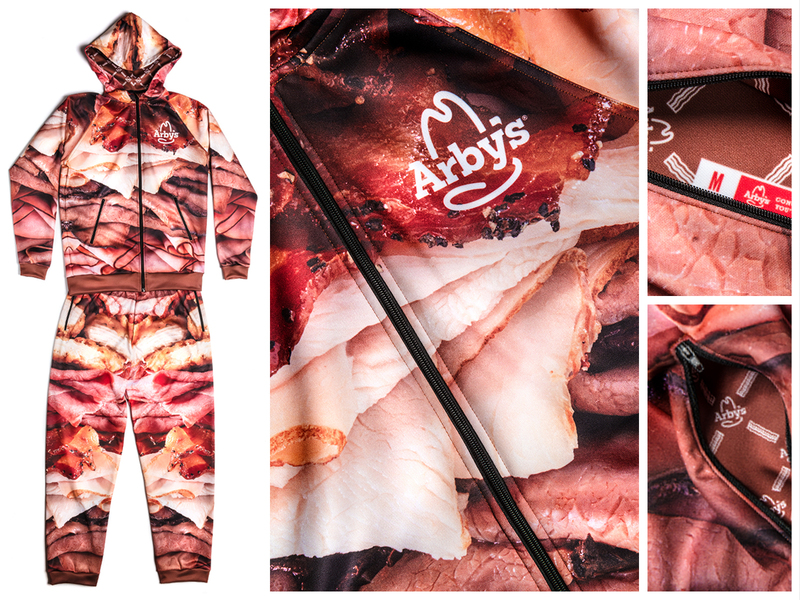 If the team at the fast-food chain loves your public display of meat affection enough they might just send the meat sweat suit over to you. We got a sneak peek at the suit before anyone else—and let me tell you now, this piece of food fashion really does—perhaps too passionately—display a love of Arby’s meat. There are some very close-up shots of meat slices on the hoodie and accompanying pants. Only true meat fanatics should even consider vying for a chance to own one of these suits. It will likely take a lot of courage to wear in public. But if you are cooking up your favorite meat dish in the privacy of your home, or lounging around after a decadent meal of Arby’s sandwiches, this loose, soft, comfortable meat sweat suit will serve you very well indeed.